In 1998 our Musical Director Ethel Glancy (MA Mus) was approached by a number of like-minded guys who wanted to start a new choir with fun, informality, camaraderie and a love of singing at its heart. 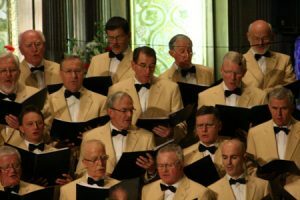 The Celtic Choristers was born and in the intervening years the Choir has steadily established itself in the Choral World. The Choir regularly performs at weddings, social, religious and business events and charity fundraising concerts and is proud of past performances in Ireland and abroad including Dublin appearances in the National Concert Hall, The Royal Hospital Kilmainham and Áras an Uachtaráin. Over the years the Choir has competed successfully in Choral Festivals at New Ross, Navan, Sligo, Coleraine, Bangor and Llandudno Wales. If you would like to discuss engaging the Choir for a wedding, business event or for a concert to support a community or charity fundraising event – please email us here. An amateur group, the Choir members come from all ages and all walks of life. Some are experienced choristers whilst others are newcomers to choir singing. The Choir welcomes new members for all voice parts and an ability to read music is not essential. If you are interested in joining please email us here OR come along to a Thursday Rehearsal and sit in to see if you like the experience. 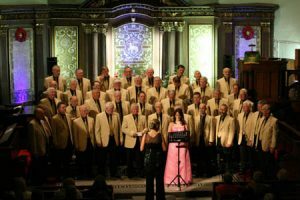 An all-male voice choir has a unique sound and needs to be heard live, when it should truly inspire you – whilst actually singing in such a group is an entirely unique experience.